The garden has gotten its first real round of work. I left a couple little rose bushes and some balms root as it is a very edible plant, and got the seeds in. 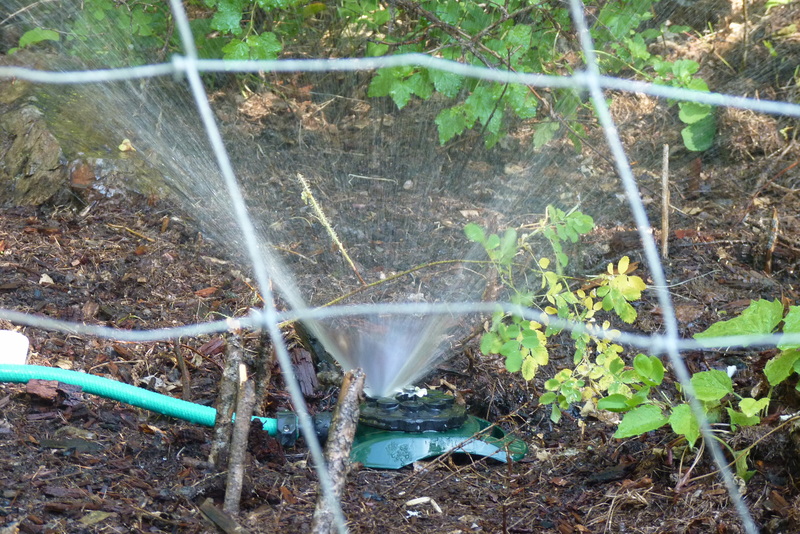 I was running the hose down from the spring itself for a few days but the water flow was just little more than a trickle by time it got all the way down tot he garden. 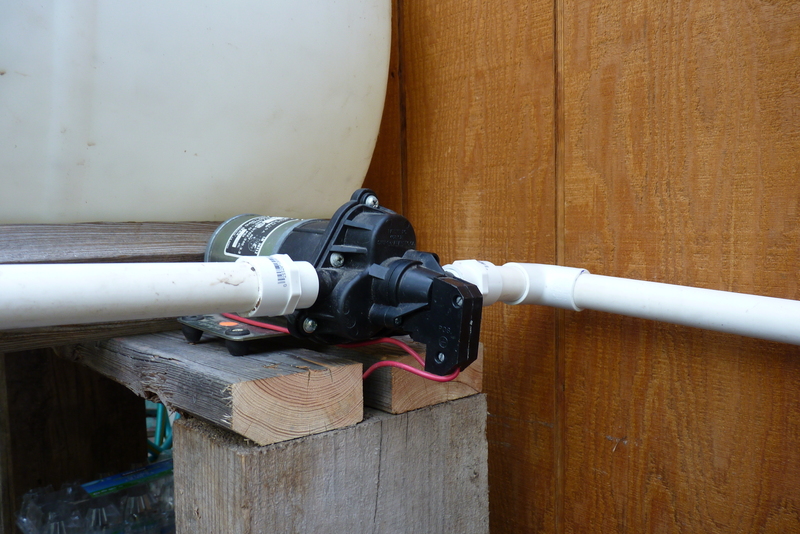 After I hooked the hose to the water barrel, (not to the pump) messed with the lay out of the hose, and got the air locks out of the line, the problem was solved! Water Pressure! Yeah for gravity. Up at the little cabin I got the new pump hooked up. It is a good deal smaller than the one I had before. I want to use it a bit before I write about that, but its in, so washing hands and dishes just became a lot easier! The weather has been getting hot enough that soon it will be a perfect day for dressing up the spring, getting the box over it and beginning to dig the permanent lines. Once that is done then the only real project for the water system (at least for this year) will be to build the solar hot water heater. The copper pipe is still in a pile, just need to get the solder and the ‘T’s’ to put the base together. 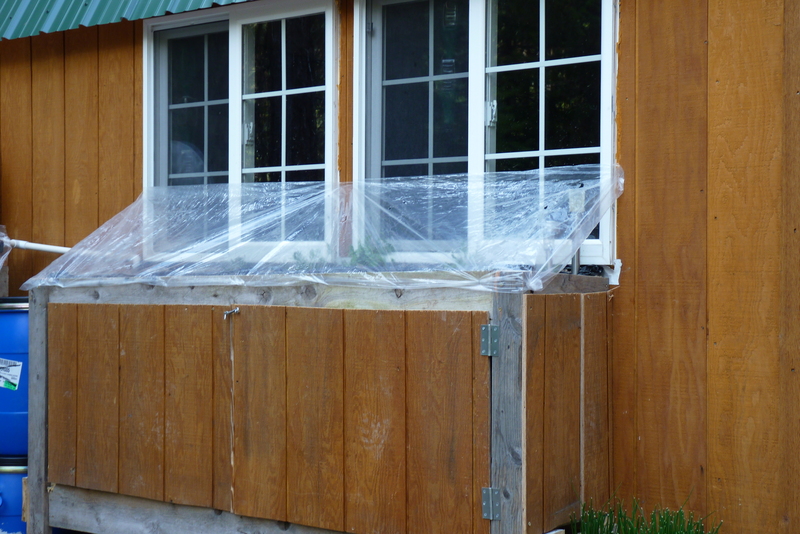 The insulation board and the glass are waiting against the green house as well. One project always tends to lead to another. This entry was posted in homesteading, offgrid and tagged gardens, homesteading, offgrid, tiny house, water, water systems on June 11, 2015 by Anjmacz. The day started out a bit cool but about perfect for sitting outside with a mug of hot coffee. 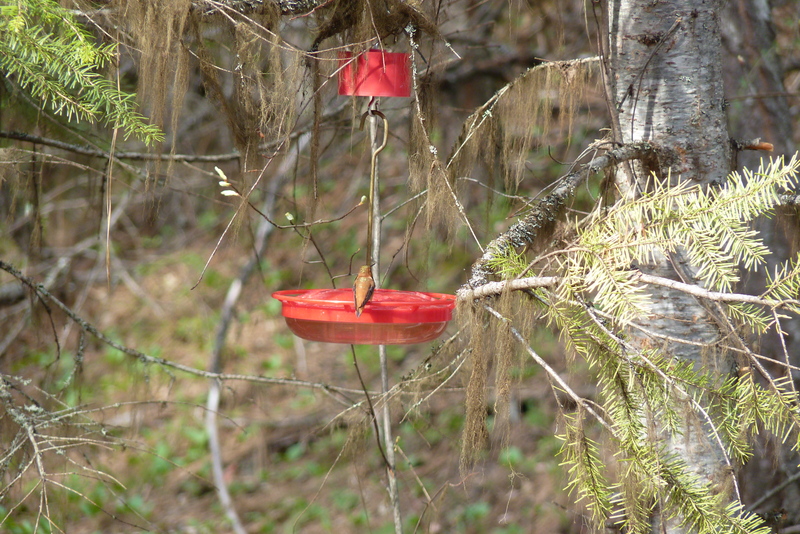 While debating if it was worth starting a fire in the house or not I got to watch the humming birds come in. 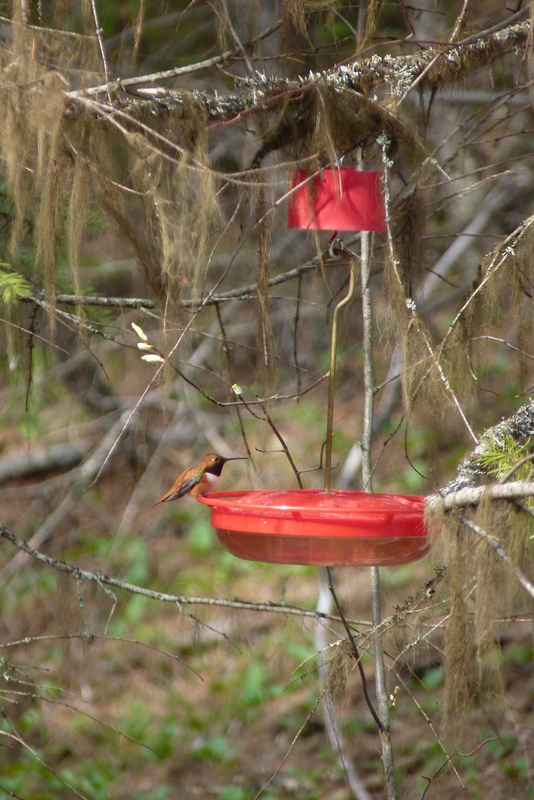 Of course they had to argue a little of who had rights to the feeder. They buzzed around so fast it was hard to even see where they were going. James and I went up the road to help the neighbour before we set to work on our own projects. 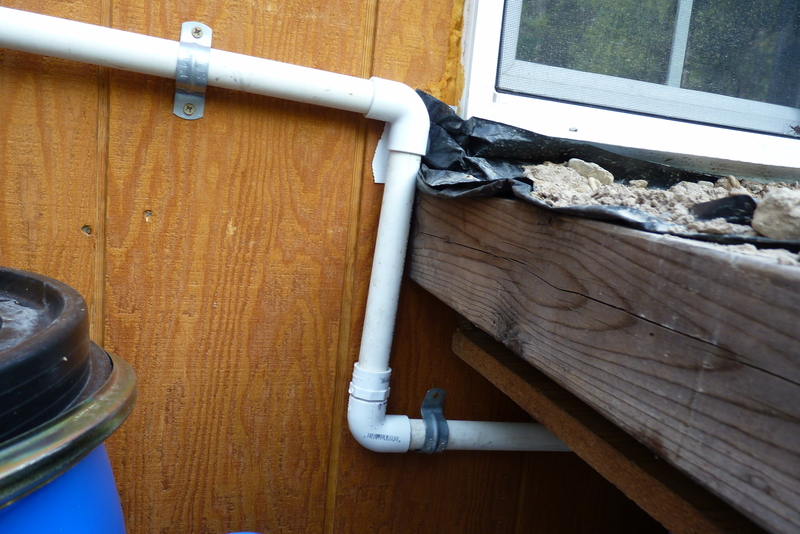 The main goal of the day was to get the plumbing in place to get the water to the house. 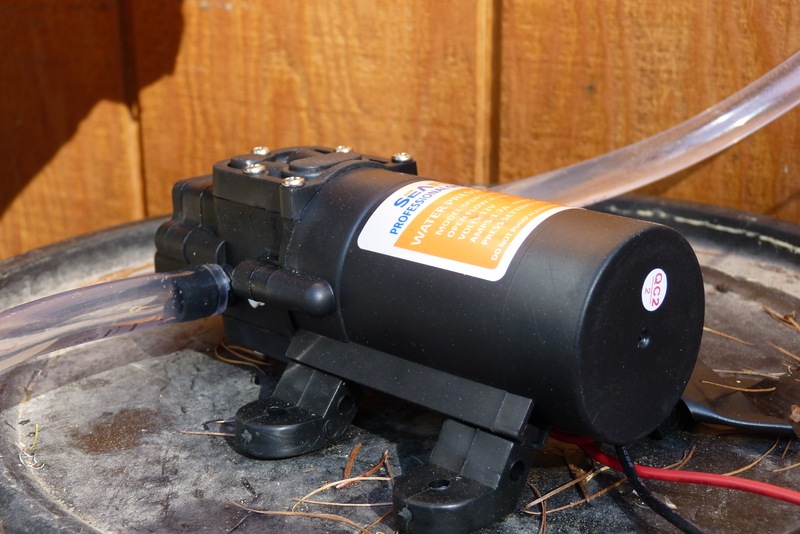 We lifted the barrel higher than it was originally to try and improve the water pressure but we still didn’t get as much as we wanted, certainly not enough to get my hair clean in a shower, so the 12 volt pump was inserted into the line. The water goes down and around the window garden. They will be wrapped in foam and hopefully the front green house will be in by this fall and the water system further protected but if not, it will have to be all drained. 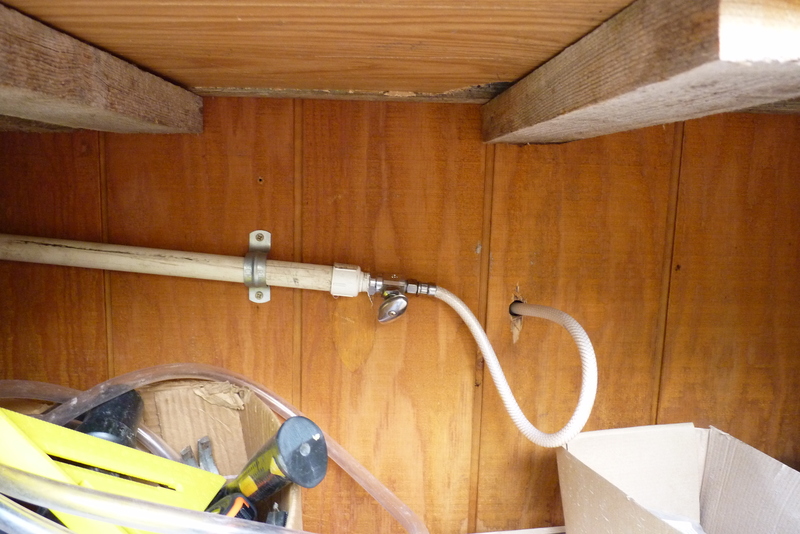 The old water line is all connected, the hot line is not in yet, but that will be a project for next weekend. While cleaning up I went ahead and put the doors on the front and closed the ends quickly. They need a little trimming but for now it closes in the end. Nights are still getting frosty so the little garden is still covered. The plants that were put in are doing great and today the radishes started to show up. Maybe by tomorrow the peas will pop up their heads as well. Spring is definitely here and progress is starting to be made. 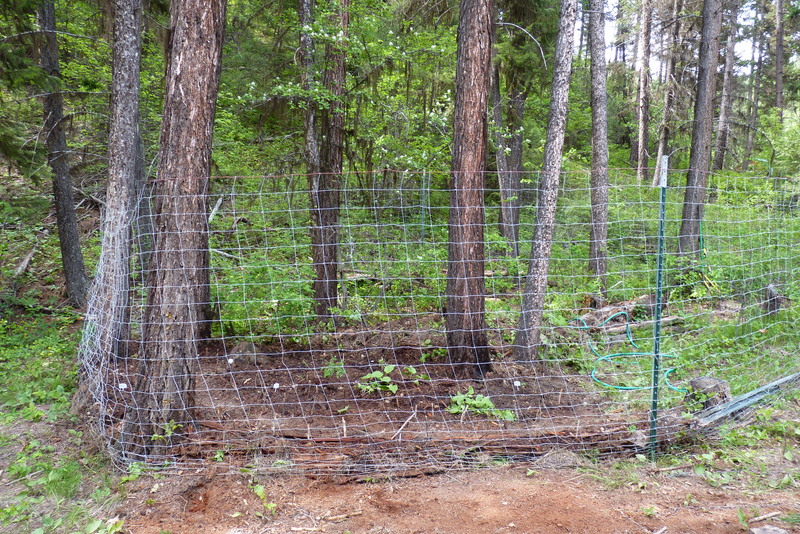 This entry was posted in homesteading and tagged 12 volt, gardens, homesteading, montana, offgrid, water systems on May 2, 2015 by Anjmacz.